The Research Council of Norway and Norway’s research institutions are providing a total of NOK 1 billion to 46 FRIPRO Toppforsk projects (FRIPRO - "Frie prosjektmidler"). Each project will receive NOK 15–25 million over a four-to-five-year period. FRIPRO is an open competitive arena for all research areas and disciplines, where there are no thematic guidelines and no requirements relating to the applicability or immediate utility of the research. The competition in FRIPRO is tough, and only the best researchers with particularly good projects and very well-written proposals have a chance at succeeding. 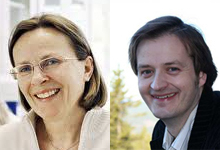 University of Oslo and Oslo University Hospital based research groups led by Ragnhild A. Lothe from the Department of Molecular Oncology and Michael Bretthauer from the Department of Transplantation Medicine are among the successful applicants. Funding for Toppforsk projects is being provided in a joint effort by Norway’s universities and other research institutions and the Ministry of Education and Research and allocated via the Research Council. This is the third such joint funding initiative for the FRIPRO scheme for independent projects. Funding is only being allocated to projects that have received the highest score after review by international referee panels. The universities themselves have selected projects for funding from the list of top-ranked projects at their institution. All of the universities have been given funding for at least one Toppforsk project. University colleges, research institutions and the regional health authorities are participating in the joint funding initiative for the first time. Lothe and Bretthauer are given support for the projects "Modeling tumor heterogeneity in colorectal cancer management" and "COLOSS - COLOn Screeening and Surveillance: Comparative Effectiveness of Colorectal Cancer Screening and Surveillance" respectively. Together with the Research Council, the Medical Faculty, University of Oslo , support their research through TOPPFORSK, spanning from cancer prevention to genomic tumor heterogeneity. Ragnhild A. Lothe's research group "Genetics"